In part 2 of our Guide to the Growing Long Term Post-Acute Care market, we ask if your agency is ready to expand into other service lines. The evolution of the long term post-acute care (LTPAC) market means that it is more important than ever to be competitive. Your primary goal is to care for your patients to the best of your ability. However, the only way to acquire more patients is to outperform your competition. 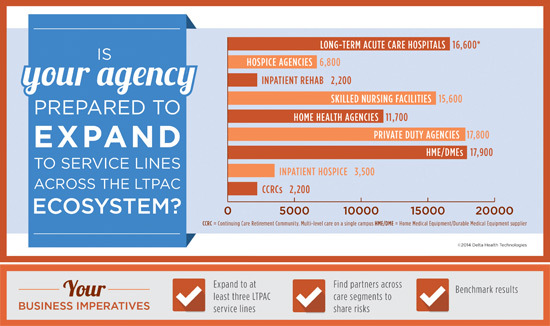 Stay tuned for more infographics related to the growing LTPAC market.